PIEDMONT – After another sluggish start, Piedmont was in search of a spark late in the first quarter. As is usually the case, the Bulldogs turned to their sixth man, Silas Thompson, and the junior forward wasted little time in providing the spark. 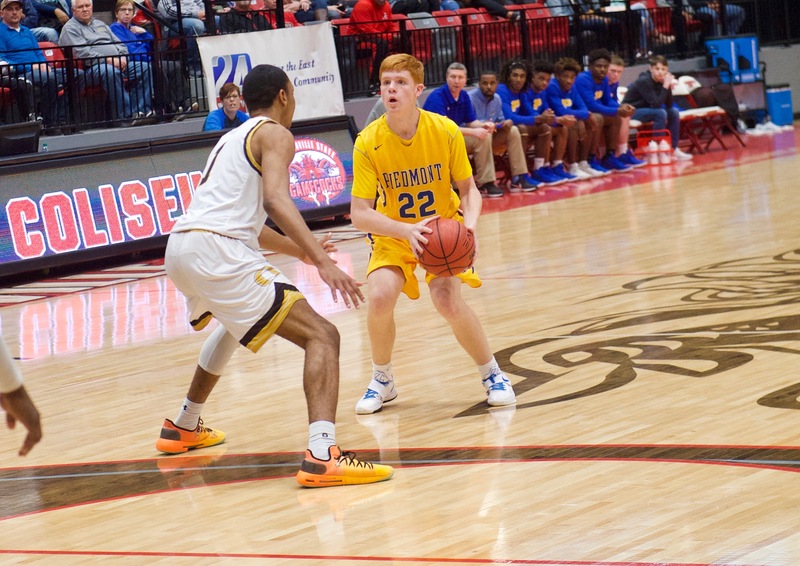 Thompson came off the bench and hit back-to-back 3-pointers to finally ignite a dormant Piedmont offense and give it some cushion on the way to a 62-37 win over upstart Saks in the Class 3A, Area 11 championship game. “We fed off of that momentum early,” Piedmont head coach JoJo Odam said. The win gave the Bulldogs (21-5) their fifth straight area championship and tenth since 2008, missing only in 2013 and 2014 in the run, and allows them another home game, hosting Sylvania in the sub-regional Tuesday. Saks, meanwhile, goes on the road to face defending 3A state champion Plainview. Thompson’s two shots from deep came with the Bulldogs leading just 8-6 late in the first quarter. They never looked back from there, cruising to a comfortable victory that had both coaches emptying their benches in the fourth quarter with the game well in hand. Thompson provided the needed spark, and finished with 16 points off the bench, while eighth-grade wunderkind Odam finished Saks off on his way to a 19-point performance that clinched the tournament MVP. Odam poured in 16 of his 19 points in the first half, outscoring the Wildcats by himself through the game’s first 16 minutes with the Bulldogs going into the half with a 32-14 advantage. Odam was joined by two of his teammates – seniors Carl Myers and T.J. Fairs – on the All-Tournament team. Myers had a relatively quiet evening, finishing with seven points and eight rebounds, while Fairs had his typical all-around game, finishing with 11 points, five rebounds, and six assists. Saks made a surprising run to the championship game after a stunning upset of Weaver on Thursday night. The Wildcats couldn’t find that same Cinderella magic on Saturday, with the clock striking midnight on their hopes of a second straight upset and an area title. Saks got to the final thanks to a 30-point performance in the semifinal by junior Zay Elston, who knocked down seven 3s in the game. But on this night Elston and the entire Saks team was bottled up by Piedmont’s defense. He finished with just two points, and those didn’t come until the fourth quarter with the outcome long since decided. Elston was still a member of the all-tournament team, joined by his teammate Tyler Smith, the lone Wildcat in double-figures scoring on the night with 10 points. A big part of the defensive effort was from Piedmont’s big-man in the middle, senior center Delo Foster. Foster didn’t score a single point, and didn’t even attempt a shot, but he made a big contribution with his rebounding and his ability to alter shots at the rim. Foster finished with 12 rebounds and blocked three shots, with numerous more being altered by his length at the rim. The win for Piedmont was doubly important because the Bulldogs not only get the Area title, but they get to play another game in front of their home crowd as well as avoiding an early playoff matchup with defending State Champion Plainview. Saks draws that unenviable task instead. Coach Odam knows that all roads will likely eventually lead to a matchup with Plainview and its high-powered offense. The Bears rolled over Sylvania 103-55 in their Area final, and scored 100-plus points in both tournament games. Odam isn’t looking past Sylvania, though, knowing that his team will have to play good basketball to get past them. But the thought of a matchup with the defending state champions is definitely something that has been on his mind. He’s just in no rush for the matchup to come about. SAKS – Tyler Smith 5 0-0 10, Zaejuan Johnson 1 0-0 3, Daveon Dukes 2 2-2 6, Conor Martin 1 0-0 3, Zay Elston 1 0-4 2, Benji Wilson 1 0-2 2, Kyle Goedde 0 0-0 0, Pat Williams 1 0-0 2, Jordan Cosper 4 0-0 9, Kamon Wilson-Hall 0 0-0 0, Miles McLaughlin 0 0-0 0. Totals 16 2-8 37. PIEDMONT – Carl Myers 2 2-2 7, Kaedon Jenkins 2 0-0 5, Delo Foster 0 0-0 0, Silas Thompson 5 4-7 16, Alex Odam 7 3-3 19, T.J. Fairs 4 3-3 11, Malachi Jackson 0 0-0 0, Jakari Foster 0 0-0 0, Sean Smith 1 0-0 2, Elijah Johnson 1 0-0 2. Totals 22 9-12 62. 3-point goals: Saks 3 (Johnson, Martin, Cosper); Piedmont 6 (Myers, Jenkins, Thompson 2, Odam 2). Total fouls: Saks 13, Piedmont 9. Officials: Cosby, Chambers, Dupree.